Today was the first weekend without a road race for some time, mainly because there wasn’t much local, and also as it looked like it might be my only chance to do a 25 this year, an added bonus was that it was part of our club TT series, and being the fastest Wheeler in this TT would net me the trophy for this year, annoyingly it fell on the same day as our club ten where I would have won the trophy for that had I ridden, but I prioritized. 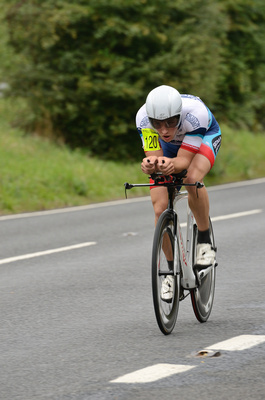 The event was on the Bentley H25/8 course where I had done a ten a few weeks back and took the win, and where last year I attempted a 25 on my roadbike only to flat at the 16 mile point. Bizarely despite having done a fair few TT’s this year, I’d not really done anything like this, I’d done a 30 mile sporting course, and also an 18 mile sporting course, but the way you ride those is rather different to a dual carriageway style event. I knew that from my efforts in 10’s what my power should roughly be. Only issues were that I’d had two days fully off the bike, and that the wind was blowing a gale Not ideal! Had a little warm up and almost binned it at 15 mph when a crosswind gust caught me by surprise while I was warming up, good start. Got down to the start-line and surprisingly it was still dry despite HEAVY rain being forecast. I got off to a start and had to mentally tell myself to keep it in check, I was aiming for a certain wattage into the headwind sections knowing it would be hard to get the power down the other way. I got to the first turn and it was like suddenly I was riding without a brake engaged, I hit the tailwind section and that was it, flying time! Suddenly it was 35mph at all times, and getting to the point where 53-11 was showing its limitation, I did that 7 miles at over 32 mph hitting 40 at times, I would have loved a 55-11 for that. After a blast into the headwind back I had kept the average over 28 MPH, it was looking good – I was also still dry! Back into the huge wind once more and it was full gas time, I was really motoring, I saw 49 tick by, and had distance hopes of a 50, but then 50 ticked by, and the finish never seemed to come, I did almost 33 mph for that return leg with the last 5 mins at full power and over 36 mph, I stopped the clock on 51.40 – to be honest I was pretty pleased with that as a first attempt on a tough day. Predictably my power was not quite where it should have been, I put this down to the overly positive TSB, but it wasn’t a million miles away and importantly I went quickly for that power. I trundled back up to the HQ where once I had been a cub scout, and waited for the times to come in, I was feeling positive, James was the next in and he did a very impressive 52.08, having looked at his position if he can increase his power he will go bloody fast as he looks super aero (and he went onto win a road race the next day with a 25 mile solo break, solid ride), so it was a case of waiting for Richard to finish, he came in and said he’d done a short 53, so that was confirmation of the win, which was a good feeling. And by some margin. Today was a SERRL race on the Lamberhurst/Frant circuit, I’d been told it was a tough circuit that had a couple of fairly taxing uphills, and a finish at the top of a 3-4 minute hill. I will be honest, initially I thought it would suit me quite well given there was nothing all that steep. I’d had a fairly hard week on the bike, and though I brought my TSB (power geeks will know what I mean) slightly positive as I always do, there was no denying that my legs ached on the day of the race, quite annoying, and obviously highlights the flaws of training with power, not all TSS is equal. Anyway, we got started and I felt fine, it was a super quick pace for the first couple of laps with the 9 Pedalheaven boys trying to force a selection, at first I felt good and was moving with the right wheels etc, but I think in that first hour I might have put myself about more than I should have, don’t get me wrong I wasn’t doing a Jen Voight or anything, but in the company of plenty of elite riders on a tough circuit I would have been better ‘keeping my powder dry’ for a little longer. A few moves went off, and at the 40 mile point I was pretty sure I wasn’t going to be doing anything of note, a few more times up the hill and I was struggling, aches were deep, like I’d been riding intervals the same day before the race. I kept going for training purposes, and with a couple of laps to go we were in a fairly whittled down group with 8-10 away and the heavens opened, a few things went, I tried to get away with Connall Yates and a couple of others, but it wasn’t to be, I saw a few more moves go which is always what happens in these races, they’re very much about attrition and eventually everyone who has remotely anything left gets up the road and everyone else either rolls in at snails pace or pulls out. And in fact a huge number had already climbed off. As we approached the final lap in the heavy rain I started wonder why my bike suddenly felt so Spongy, I looked down and sure enough, I had a puncture. The cars whizzed by, I did put my hand up, but I don’t think there was service, and to be honest, I doubt I’d have got back on if there was. Ever since being lumbered with a long walk a year or so ago, I carry a co2 and super light tube just to get me back to the car, so I whipped wheel off and did just that and rolled back to the HQ and watched the last lap unfold. Turns out that of the initial break Jake and Rhys Howells had got away, and Jake beat Rhys in the sprint to claim another road win for this year. No road races this weekend gone, I have one coming up this Sunday down in Kent, but wanted to write just a bit about the good old club ten. I think I’ve done in the region of 10 club tens now since I joined the club, I can’t make every one, and the early season ones are a particular challenge to get to as work is not local and getting home, in the car and down to Dorking is not the quickest process. Now I’ve moved a further 10 min walk from the station its even harder. However, as the evenings drew longer I was able to get down there. There seems to be quite a divide between people that race on the road and those that specifically do TT’s, even though I personally think they compliment each other quite well in terms of training and net effect on each other. What I really like about our club ten is that is attracts a huge variety of people from our club, people that race on the road, people that don’t race, and people that just do TT’s. Its a great mix. My journey as far as the club ten’s are concerned is probably one that many people make, I started off on my road bike with no TT specific add-ons bar a skinsuit and a insulation taped road helmet, I managed 22.17, initially I was a bit annoyed with it, afterall you look at the results of your local TT’s and all you see if 19’s 20’s and in some cases the odd 18 too. This led me to aero upgrades, so I could go faster on the same power, I moved onto aerobars which gave me another few seconds, though I never managed to crack 22 that year. As time went by I saw how fast people were going, and I wanted a bit of it, as you’ve probably read in another post, I bought a Trek Speed Concept from a clubmate and kitted it out with some aero wheels and all the rest. Since then my fascination with TT’s has grown, and though I feel like I’ve kind of neglected them this year given I’ve done a handful of open events, but barely anything longer than 10 miles, one thing I’ve tried to make a point of doing is the club tens as the course (G10/42) is quite an honest one, not many gifts, not much chance of a hold up, and I know it well – the TT bike was a bit of a revelation time wise, it immediatley took a minute off what I was doing, and that was with a position I had not really explored and power that wasn’t anywhere near what I’d want to be doing now. I was down to around 21.07 as a best, I was eager to break that 21 barrier and get into the faster times. This was going to take some doing though, and it actually took a bit of thought, and the fear of getting caught by a minute (30 second) man to spur me into action. I managed to do 20.46 that particular day, and upon trying again was slower, I thought that was as good as it was going to get on that course for me this year. I’d given it my all, hit all time high powers for the duration and thought I was in a pretty good position. However last night I went along and gave it another crack, conditions looks poor, low temps, and crosswind, however as I set off and went about my usual pacing for this course of ‘blast up the hills, and relax a bit down them’ I could see it was fast, and in fact I got to the turn in good time, still 10 seconds down on my previous best, I’d kind of given up hope with this ride, and consigned it to be another sub 21 but nothing of note. However upon setting off on the way back, where I should have been getting crosswind, I felt like I was being pushed along, and actually holding 30 mph along the draggy bits felt OK. I was flying, my legs were feeling it and I knew I had to dig in, I glanced down, saw there wasn’t long left and I was still in the 19’s, there was a fleeting thought that I’d do a 19, but I then was put firmly in my place when I saw I had another few hundred mtrs to go, but when I did cross the line and stop the clock in 20.18 I was very surprised. That was miles better than what I’d done previously, and it would seem others agreed, a PB night for many. Bit of a ramble on, but that is the story how in 8 club tens I shaved dead on 2 mins off my time, its taken a new bike, sure, but actually its been great fun working out what does and doesn’t work, and how to ride a particular course, there is actually little doubt in my mind that when F11/10 comes good after the initial re-surface job I will do an 18 on it, whether or not I get a day like Steve got and put in a storming ride to beat his record I do not know, its a big ask, and to this day its the fastest 10 that has been done this year in any open event. I’m still unsure which way my riding will go over the next couple of years as I undoubtedly have less and less time due to work and all of what being an adult entails, but I don’t feel like I’ve realized most of my potential yet, if I’m honest with myself about the riding I do, its pretty lackluster and though I look and see that I’ve done 10-12 hours a week each week for 2 years I also see that the vast majority of this is still far from optimum. I’m planning on working with a coach over the winter, I’ve narrowed a couple down, so am hoping that with a bit of direction and a bit of willpower on my part I can build on this year and compete properly in the National B races.